It is hard to get my mum to take health supplement. She always tells me that she is taking so much medicine from the hospital why she has to take additional medicine. She has the wrong perception that all kinds of tablets/capsules are medicine. It was when I brought her to visit the doctor as she complains of severe body itchiness that affecting her sleep. Unfortunately the doctor's office was closed on a public holiday Saturday. We went to the nearby pharmacy to look for some sore throat medicine for my better half and my mum wanted to get some other medicine that might help to stop the itchiness. 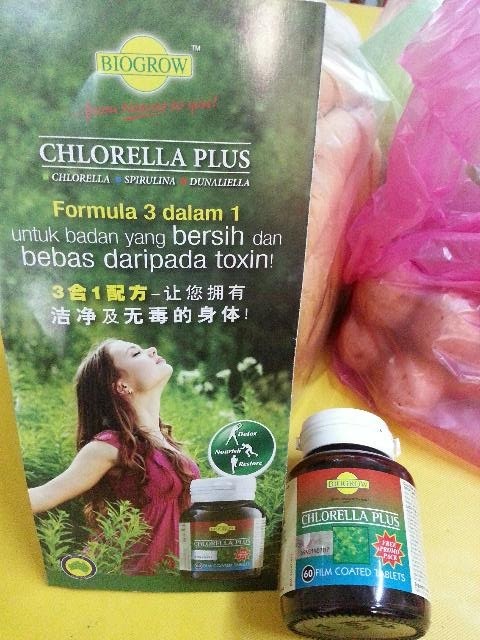 Instead the pharmacy introduced us a supplement that cleanse the body, my mum has been suffering from constipation, I thought this supplement might help her to go to the toilet smoother and thus helps to detoxify her body. I bought the BIOGROW CHLORELLA PLUS for her which contains Chlorella, Spirulina and Dunaliella which she has to consume 2 tablets each in the morning and night after meals. Hope she is consistent in taking her supplement on a daily basis, and at the same time I also have to take mine too. What are the supplements are you taking? Are they effective ?